We are enamored with the wines of Alsace. Although this classic region is often forgotten in the fickleness of fashion, we honor this region's 1000+ year winegrowing tradition with distinctly Oregonian renditions of the 4 'noble" varietals (Riesling, Pinot Gris, Gewurztraminer, and Muscat), which were elevated above the other grapes (Pinot Blanc, Sylvaner, Chasselas and Auxerrois) in 1644. Pinot Gris is our flagship white. We have made Pinot Gris wines since our first vintage in 1996, and starting in 2014 the grapes are 100% estate grown. We planted a 2 acre parcel of Pinot Gris on a west facing slope in 1999, in the cool northwestern corner of our property surrounded by ancient oak trees. This block is supplemented by 2.5 acres that we lease from the Karl family at Rivenwood, which is adjacent to our property., and farmed as an extension of our estate vineyard. Both of these vineyards share soils derived from marine sedimentary sandstone, which imparts and underlying stony/saline character to the wines. We favor a rich, opulent style that is diametrically opposed to the simple, innocuous style of Pinot Gris that has become all too common in the Willamette Valley. To achieve this, we harvest late (often after our estate Pinot Noir) to allow the grapes to ripen fully and achieve more flavor authority. The grapes are crushed and pressed with several hours of skin contact, and the juice is allowed to settle for 48 hours prior to racking off the heavy solids for fermentation. Vinification is conducted in a mix of stainless steel tanks, 1200 Liter foudres, and neutral barrels. The wines are raised on their lees for a 10 months, and bottled in the late summer or early fall, right before the next harvest. No sulfites are added until bottling, and the wines are held for at least a year prior to release to allow them to fully recover from the intrusive "shock" of bottling. Special reserve bottlings are produced occasionally when vintage conditions provide something truly profound and worthy. Pinot Gris is incredibly food friendly, paring with everything from sashimi to top sirloin! Riesling was an early passion of winemaker Brian O'Donnell, who discovered the wines of the Mosel and Rhine in the terrific 1975 and 1976 vintages. We have made minuscule quantities of Riesling over the years from a variety of sources: Yamhill Vineyard from 1997 through 2011, Chehalem Mountain vineyard from 2002 through 2006, and Hyland vineyard from 2013 through the present. 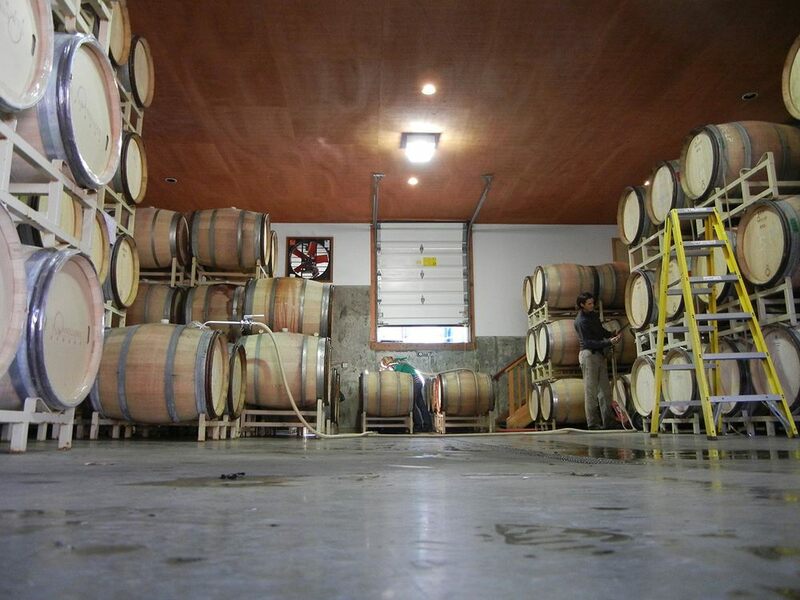 Wines are vinified in stainless steel tanks in the modern Oregon style: crisp and dry with flavors and aromas ranging from citrus to stone fruits. These wines can be very austere in their youth, but we've found that with a half dozen years - or more - in the bottle, they take on a creamy texture that balances the searing acidity and makes them an absolute joy to drink. So we will typically offer these wines when they reached the optimal window for enjoyment. Dungeness crab is the classic Pacific Northwest paring! Our Muscat is a collaboration with neighbors at Stag Hollow Vineyard. Owner/winegrowers Mark Huff and Jill Zarnowitz approached us several years ago with a proposal to take their grapes, make wine, and split the bottles (ie some with a Stag Hollow label that they would sell, and some with a Belle Pente label that we could offer to our customers). We tried it on an experimental basis in 2007, and have been doing it ever since! The vineyard is primarily Muscat Ottonel with a little bit of early Muscat, and we harvest early to preserve the fresh acidity. The grapes are whole cluster pressed with several hours of skin contact, and the juice is fermented "cold and slow" in stainless steel tanks that remain outside through the winter. The wines are made in the classic dry style that is quite rare in our modern world dominated by sweet Moscato. Enjoy as an aperitif, or with wine-unfriendly vegetables like asparagus and artichokes. It's also really good with blue cheese! Gewurztraminer is the "weak leg on our stool" of Alsatian varietals ... we made delicious , opulent, dry to off-dry wines from Hyland vineyard from 2003 through 2006, and are currently cultivating a new source ... stay tuned! Belle Oiseau is a proprietary blend of Riesling, Pinot Gris, Muscat, and (sometimes!) Gewurztraminer. It is inspired by the traditional Edelzwicker wines from the Alsace region, which until about 50 years ago could only be blended from some combination of the aforementioned "noble" varietals. Belle Oiseau is a collaboration with our friends at Little Bird Bistro in Portland. We met co-owner Andy Fortgang when he worked at Craft in New York, and shortly after moving to Portland, he approached us with the idea of making a proprietary white wine for the restaurant. Originally offered only in kegs at the restaurant, it is now bottled and available from the winery as well. The blend is different every year, and determined during the summer after harvest by the Little Bird and Belle Pente wine teams (the whole handful of us!). Belle Oiseau is intended as a first course wine at the restaurant to equally complement their extensive home made charcuterie and raw oyster offerings. Pinot Noir is the raison d'être for Belle Pente, and indeed the entire Willamette Valley wine region! Pinot Noir grapes are harvested early on cool fall mornings, and whisked to the winery for intensive hand sorting. A small percentage of whole clusters have been incorporated in recent vintages, but most of the fruit is gently de-stemmed. After a week of cold maceration, the vats are warmed to room temperature and fermented with isolated indigenous, resident ambient, and (occasionally) selected commercial yeasts. Following fermentation, the wine flows directly into barrels (25-35% new French oak) in a cold cellar, delaying the secondary (malolactic) fermentation until the cellar warms up naturally in the spring and early summer. Wines are assembled after 10 to 18 months and gravity bottled (on our own machine, not a contract bottling truck) without fining or filtration. These techniques highlight varietal fruit flavors and the unique characteristics of each vineyard site. Our “house style” emphasizes freshness, complexity, focus, elegance, and balance. Belle Pente Pinot Noirs can be enjoyed young, but will also reward careful cellaring. Annually we produce up to 6 different cuvées of 200 - 900 cases each. Our family of Pinot noir wines currently has 5 members, in "4 tiers", mirroring the hierarchy established in Pinot's motherland of Burgundy. In most vintages this includes a "good, better, best" progression of wines exclusively from our estate vineyard. At the "regional" level we have our Willamette Valley Pinot Noir, which is sourced from 4 vineyards (including our Belle Pente Estate vineyard) all located in the prestigious Yamhill-Carlton and Dundee Hills appellations. So it is like having a Bourgogne Rouge with all the grapes from Vosnes and Gevrey! It is a wine that punches well above is relatively humble appellation. Although the percentages will vary from year to year, fruit from our Belle Pente estate vineyard is generally the major component of the blend, supplemented by Murto and Bella Vida Vineyards in the Dundee Hills, and Foxy Rock in Yamhill-Carlton. The estate fruit comes from younger blocks on the property, and sections that we crop heavier and pick earlier, with the intention of making an easy drinking wine that is lighter in texture, and ready to drink on release without requiring additional aging. It is raised primarily in older barrels for a full year, assembled in tank during the next vintage , and bottled during the winter. A perennial favorite of the New York Times tasting panel, and a “go to” glass pour Pinot at great restaurants around the country, it is one of the best values you are likely to find for a true, artisan-produced wine. Next up is the Yamhill-Carlton Pinot Noir, reflecting a "village" level wine. In most vintages it is 100% estate grown, from younger wines near the top of the Belle Pente vineyard. These blocks get picked early and raised in mostly neutral barrels to emphasize freshness and bright fruit attributes. At the "Premier Cru" level are our two single vineyard wines: Murto Vineyard from Dundee Hills, and Belle Pente Vineyard from our home base in Yamhill-Carlton. The pinnacle of our Pinot program is the Estate Reserve, a block and barrel selection from the best parts of our Belle Pente estate vineyard. These parcels represent the "Grand Cru" section of the vineyard, with shallow soils on a steep slope, that produce wines with great concentration of flavor and aroma, and sublime structure for the cellar. Contrary to popular folklore, humans cannot survive on Pinot Noir alone! Our estate vineyard includes a scant half acre of Gamay Noir, and we've made a varietal bottling since 2009. Cuvee PTG is our tribute to the traditional Gamy/Pinot noir blends of burgundy (know as Passe Tout Grans). Cuvee Contraire is our proprietary Rose-style blend of "white" Pinot Noir, usually with a touch of Gamay, and occasional guest appearances byt Pinot Gris and Gewurztraminer! In most vintages this includes a "good, better, best" progression of wines exclusively from our estate vineyard.